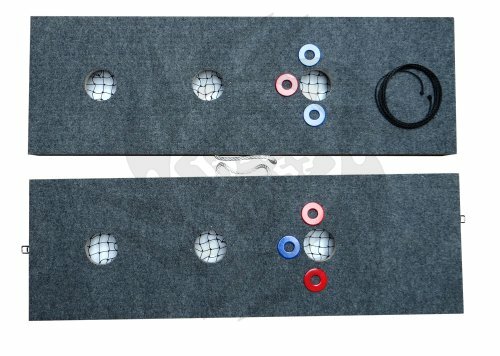 3 Hole Washer Game Set (Includes 6 Washers). These professional-quality Boxes have our fancy Rebel wood finish and gray carpet. Each Box measures 48in by 16in by 3in and the washers are 2.5in in diameter. A set includes two Boxes, 6 powder-coated washers (durable, not painted!) and a measuring rope. These boards are of great quality and include some nice add-ons that other boards don't have. Pick the color of your washers, leave us a note at checkout for the colors · Includes 2 Wooden Boxes and 6 washers and measuring rope. · Made from high-quality marine-grade 100% real Baltic birch plywood. · Holes have nets to hold washers. · Easy to transport because both boards buckle together and both have handles. Not heavy, yet super durable construction. · Pro-quality. · Rubber Feet. · Small storage size. · Perfect for the whole family, camping, picnics, outdoor, indoor. · Rebel Finish with gray carpet. · 10 washer colors to choose from. If you have any questions about this product by Vorticy, contact us by completing and submitting the form below. If you are looking for a specif part number, please include it with your message.